If you own a premium, category-killer domain name and are looking for ways to monetize it, you have undoubtedly thought about selling third-level domains – like safari.Africa.com, where “safari” is the third level of the Africa.com domain name. But offering third-level domains for sale and actually getting sales are two entirely different propositions. Today’s guest, however, has sold hundreds of Africa.com third-level domains to large companies, including IBM, Starbucks, Twitter, Evian and Standard Bank. In this interview, Ope Odusan openly shares how Africa.com has accomplished it and discusses prospects for future sales, especially with the impending launch of geographic top-level domains like .Africa, .Joburg, .CapeTown and .Durban. Ope Odusan is the managing director of Africa.com domain names. 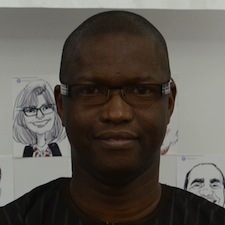 Prior to his role at Africa.com, Odusan was chief operating officer of the Nigerian Internet Registry Association. If you own a premium category-killer domain name and you are looking for ways to monetize it, you have undoubtedly thought about selling email addresses and third-level domains. Today’s guest has experienced early success in selling third-level domains – the word before the .Domain.Extension – to large companies around the world. Stay tuned to find out how. Selling third-level domain names on your premium category-killer domain name seems like an easy enough proposition, but offering them for sale and actually getting sales are two entirely different propositions. Today’s guest, however, has actually sold quite a few, and we are going to find out how he has done it and to what extent. Joining us today is Ope Odusan, Managing Director at Africa.com Domain Names. Ope, welcome to the show. Ope Odusan: It is a pleasure to be here. Michael: So let’s start with some metrics on what Africa.com has done so far. In a recent press release, I read that: “Submissions for the acquisition of Africa.com domain names are flooding in as brands seek to gain an Internet tag associated with the continent.” How many third-level domains have you registered for Africa.com so far? Ope: Well, since we started, in September, we have registered over thousands of names. Thousands, and a majority of them are brand owners right now. They are brand companies that have trademark positions, and brand owners in general. We are also getting success about half-and-half. Some of them are regular users who are just interested in getting their domain in the Africa space. Michael: So, you say brand owners, and that is typically like a trademark owner of a big company. What kinds of companies have registered their third-level domain names with Africa.com so far? Ope: We have got big names like Max & Spencer, Emirates – the airways -, and (Unclear 2:37.2) Airways. We have got IBM. Twitter. Starbucks. I mean the names go on and on like that. Michael: Yeah, it is amazing what you have gotten so far. I noticed the Emirates.Africa.com, for example, forwards. When you type that in, it forwards to Emirates Airlines’ website. So, a registrant of a domain name can do anything they want with a subdomain. Just like a regular domain, they can redirect users to another address. They can track usage. They can use it in branding and marketing campaigns, in print or online or on TV. Any other uses besides things like that, Ope? Ope: Well, some of them are just like you have just pointed out. Some of them are using it to direct traffic to the existing website and some of them are probably holding it for future development of an African-centric website. So, it is too early to tell, but right now Max & Spencers is redirecting to the existing website. Emirates is doing the same thing, but IBM has not done anything. So, we have probably figured they are trying to develop a specific website (Unclear 3:44.8) African market. Michael: So, in addition to trademark domain names or brands buying their domain names on Africa.com, you have also sold some premium generic-word subdomains. Can you name some of those that have been registered? Ope: Yeah, we have got quite a bit of those, names like Business.Africa.com and Jobs.Africa.com. These are names that you would normally associate with premium names, and people are realizing that Africa is the next developing part of the world and they want to take advantage of that. Michael: So, what revenue order of magnitude have these subdomain sales generated for Africa.com? Ope: Well, it is too early to tell right now, but we are (Unclear 4:30.5) money (Unclear 4:31.3). I cannot give you specific numbers, but yeah, thousands is what we are getting from that revenue. Michael: Okay. Ope, the audience has likely noticed that you have an accent. For anybody in Africa that is watching this show, they think that I have an accent, and they probably also notice that there is a slight delay in the video. Where are you calling in from right now? Ope: I am actually calling you from Lagos, Nigeria. Ope: It is about 9PM here. Yeah, so 9PM my time. Michael: Excellent. And when we were planning out this interview, I asked you when you would have the strongest connection and which location, and you said, “We need to wait until 9PM in order to do the interview,” and so I appreciate you staying late in the day to conduct this interview. Ope: Not a problem at all. Michael: So, being in Nigeria and selling the Africa.com domain names, do you think it is important to have someone from an African country, living in Africa, leading the business to sell subdomains for Africa.com? Ope: Well, I think it can help the brand. In Africa, we have both black and white Africans. So, it does not really matter whether it is a white African or a black African buying the domain, but it does matter that the company is actually physically located in Africa. So, that is an advantage. You are dealing with the African market. You can have some support locally. So, I am in Lagos and South Africa is just two hours away, and the rest of Africa is probably one hour or two hours away from where I am. Three hours at the most. So, to have the base in Africa. Michael: Definitely. So, prior to becoming Managing Director of the Africa.com domain names, you were working at the Nigerian Internet Registry Association. Is that correct? Ope: Yeah, I was the Chief Operating Officer at NIRA, which is the .NG domain name space. I was there for two years, and I decided to move on to a bigger challenge. The biggest in Africa, but Africa is bigger than Nigeria. Michael: Africa is bigger. The continent is bigger than any of its parts. Michael: What do you consider your biggest accomplishment at the Nigeria Internet Registry? Ope: Well, in the two years that I was there, when I started, there were about nine thousand domain names. And two years after I left, we were about 25 thousand and counting. What I did was I was able to do, with the help of the Board of Directors, was to open up the .NG at the second level. Previously you could not register .NG directly without going through some pretty though process and very expensive. And one year before I left, I was able to initiate and engineer the opening up of the second level with the help of the Board of Directors. Before, you would have to register at a very high price, like 7.5 million naira, or 50 thousand US dollars. And we still have quite a bit of that, but it was just not sustainable as a business model, so I was able to change that, and then get them to reduce. And from the time we actually got the opening up to the second level, the .NG was about a hundred dollars. The first day we started, we got about seven hundred uptakes that same day. So, I think it was has been a good thing. NIRA is doing very well. Their revenue continues to grow because of the (Unclear 8:14.4) names of .NG. It can form different names. Fishing. Going. Camping. It all ends in ‘NG’. You can take advantage. That was one of the reasons why I (Unclear 8:25.0) opening up, and I am glad the Board of Directors were in support of it. Michael: Yeah, definitely. I can see that. So, when you started working there to when you moved on to Africa.com, you took it from about nine thousand to 25 thousand total names being registered. Is that correct? Michael: So, Nigeria is a really big country. 175 million people, if my research is correct. About there. Ope: 160 million and growing every day. Michael: Right. And so, is .NG the largest country code top-level domain in Africa? Ope: No. It is actually South Africa, with the unique .CO.ZA. It has got almost a million names on .CO.ZA. When (Unclear 9:18.4) with .NG, we are number two, and it is probably changing. We are ahead of Kenya. So, the .NG name is more, and (Unclear 9:30.6) different names. Michael: So, if Nigeria is the second largest registry and .CO.ZA is the number one registry, do you anticipate .Africa.com will have a larger pool to pull from? Do you anticipate .Africa.com being larger than any other registry of a country in Africa? Ope: Yeah. Well, .Africa.com has the potential to be the biggest because it appeals to more people. .CO.ZA is specific for South Africa. And if you wanted to project your business to the entire continent of Africa, I mean the Africa.com domain name makes the most sense. Right now you cannot register .Africa, so that is not a question. And then, when that does come online, you have got .Africa.com; that does have the .COM name in it, and it is a much more respected, much more established brand. So, we feel and we are on track to actually be the biggest domain name in Africa. Michael: Great. And I am going to ask you a little bit later in the interview about the new TLDs that are coming out, but before we get there, I would like to look at the current market. So, the Nigerian .NG domain names are about 94 dollars per year at Registrar Web for Africa. Do you think that 94 dollars is too high based on the cost of living in a country like Nigeria? Ope: Well, yes and no. Maybe too high for some people, but because of the level of domain you are purchasing, you actually buy a second level, which is very attractive. There are other alternatives, like .COM.NG, which is about ten dollars. So, you have got the choice between a higher level .NG, which you can now use to run other top-level. I mean you have got to be able to pay for that. And then, if you wanted to go cheap, you could go to the .COM.NG route as well. So, it all depends on what your goals are. Michael: I understand. So, if somebody is running a local business in Nigeria, they can go for a lower-cost alternative .COM.NG, but if you wanted to shorten the domain name or make a domain name hack like Runni.ng, taking advantage of the TLD as part of the domain name, you could basically ten times more or about 100 US dollars and get that second level domain. Michael: Okay. So, how much do third-level domains cost for a company per year at Africa.com? So, if I wanted to own DomainSherpa.Africa.com, what would that run me per year? Ope: Well, we have got a registrant, so they all set their pricing, but it runs you from 30 dollars per year to 40 dollars. That is what I have seen so far. So, between 30 and 40 dollars is what you pay for it, and that is for the whole year. Michael: Great. And then, if I want a premium domain name, like you have mentioned earlier Business.Africa.com or Jobs.Africa.com – something that might go across the whole continent and across all of Africa.com – what would those run per year? Ope: Well, again, it depends on the name. As you know, for a premium, depending on the name, and if you are looking for a name like Safari, which is one of the hottest keywords – you can associate safari with Africa – runs up to a minimum of five thousand dollars. I mean that is the initial starting price. Right now nobody has purchased that, but it is available for at least five thousand dollars and above. Michael: Got you. Okay. So, anywhere from two hundred dollars to five thousand dollars – somewhere in there. With other domains not as popular as Safari.Africa.com being somewhere in the middle. Ope: That is correct. The lower domain names are like two hundred dollars, and then the more competitive ones are probably in the five thousand dollars. Michael: Got you. Do you notice much price elasticity in Africa? For example, if you lower your prices, do you see more registrations, or is there a limited number of registrants who are willing to pay for a premium domain name in your country, and so you can just keep it high? Ope: Well, we look at the Africa.com domain name as a special domain name. It represents all of Africa at one price. So, if you were to purchase .AO, which is Angola, for instance, it could run you three hundred dollars for just a name in Angola. In Utopia, it runs about two hundred dollars. And in Nigeria, .NG is like a hundred dollars. So, if you look at all the costs of registering each of those 54 African countries, getting a domain name for 30 dollars or 40 dollars on Africa.com is really actually a bargain. Michael: Yeah. So, I read the press release and I reached out to you in the pre-interview, and I said, “Ope, how did you get so many registrations? How did all these big brands, like IBM and Twitter and Starbucks, know to go and register subdomains on Africa.com right from the start? Ope: Well, I think (Unclear 15:13.4) what helped me was working in our favor. We launched in Durban at the ICANN meeting, which is the World Stage. Being at the ICANN meeting in Durban really helps us to let people know about how serious we are. We launched during that meeting. We also have a video called Africa Straight-Up, which is a video that really shows Africa being ready. So, when you see a video like Africa Straight-Up and you see the company behind it, you realize these are serious people. And at that event, it helped us because people now realize that, hey, I could get this domain; and if I do not, somebody else might get it. And Africa is one of the fastest growing economies in the world, so it makes sense for the brand owners to quickly adopt this domain extension. Michael: Yeah, and that makes sense, but third-level domains on Africa.com. So, Starbucks.Africa.com is not actually administered through ICANN, is it? Ope: Well, it is not administered through ICANN, but the Africa.com domain name is an ICANN accredited domain name. So, underneath that, it is being managed by Central Names, which is an ICANN registrar. Now, you have to understand that, in developed countries, people are very familiar with .COM. Now, in all the 54 countries in Africa, you are going to have two dots, no matter what you do. So, people are already familiar with dot-dot. So, if you are in the US or Europe, again, you are already familiar with one single dot. With any city TLD you are going to have two dots. Ope: So, it is not a big deal for most people that are just getting into the Internet. More than half of the people in Africa are getting into the Internet and are getting a domain name for the first time. So, having a second level or third level really does not matter to them if they can get the name they want. And .COM right now – it is almost impossible to get the names you want. So, Africa.com makes sense because you can get the name that you actually want, whether it is YourName.Africa.com or your name that you cannot get on .COM. You have got a choice. Michael: And I have never been to an ICANN meeting, so I am speaking from a point of ignorance, but I would assume that a lot of large corporations, like Starbucks and IBM and Emirates, do not necessarily send representatives to the ICANN meetings to work with the policy makers. How did these large corporations find out that they could register their name .Africa.com? Ope: Well, a lot of these brand owners and big companies work with portfolio managers. They work with people that protect their brands all over the world. The likes of Mac Monitor, Corporate CFC in Delaware, and IP Niro. These are brand protection companies and they understand the importance of protecting their client’s domain all over the world. So, when a name like Africa.com comes out and they know that IBM and Emirates and Starbucks may want to play in the African market, they recommend that this is a brand that they should associate their brand with. So, that is probably the easiest way for them to find out about it, but I think most of the names that we registered have come through those portfolio managers. Michael: I understand. Okay, so Africa.com is a .COM. It is a second-level domain. .COM registered. So, the registry for Africa.com is technically Verisign based out in Virginia, United States. And I assume – correct me if I am wrong – Africa.com LLC owns the Africa.com domain name, and then you, as a company, that owns that domain name have said, “We are going to offer third-level domains, and we are going to use CentralNic to record and sell and administer the registry of that third-level domain on Africa.com.” Is my understand correct, Ope? Ope: Yeah, that is absolutely correct. Yes. Michael: Okay. So then, because it is not an ICANN accredited registry, does that give you more flexibility in what you need to do and without having to report to ICANN or other bodies for management? Ope: Well, because the (Unclear 19:58.3), like you correctly said, it gives us flexibility, but what we have done is we have actually followed the ICANN specifications and ICANN standards. We run (Unclear 20:09.5). We run EPP standards. We run a domain name server any kind of service. So, we use the same technology that TLDs use so the stability of our domain name compares to any other in the world. A DNSSEC. Any cast server who is an EPP. These are standard at any registry that ICANN approves identical. We take the same approach. Ope: Yeah, but we do have flexibility in terms of what we can do. Michael: Great. And so, we have talked about restricted versus non-restricted when you were working at the Nigerian Internet Registry Association (NIRA). And when you started, it was restricted so that non-Nigerians could not register a domain name. And before you left, you opened it up. Is Africa.com restricted or can anybody register a .Africa.com domain name? Ope: Well, actually, Africa.com is not restricted in any way. You can register Africa.com from anywhere, and with very little documentation. Just work with one of our 1500 registrars across the world. We have got about 1500 registrars, and you can pick any of them. Just a point of clarification: .NG was not actually closed. It was just the second level that was closed. So, you could actually register .NG, unlike some other African countries, where you have to be physically present in that country, but Africa.com is not closed at all. Michael: I understand. Thank you for clarifying that. I read in a press release that the CEO of Web for Africa said, “Our customers are very excited about the .Africa.com domain and we expect to be a large seller of these names in the Nigerian and Ghanaian markers.” Has Web for Africa started selling subdomains on Africa.com? Ope: Yes, they have. Actually one of the very first registrars to integrate .Africa.com into their platform. So, if you go to the Web for Africa website, you will see .Africa.com domain names there as a choice. Ope: They have been selling names on the Africa.com names. Michael: Great. And you mentioned that you have about 1500 resellers like Web for Africa. Is that correct? Ope: We have over 1500. In fact, the entire 1500 of them are ICANN accredited registrars. Michael: Excellent. And I noticed that if I go to, I think it is, Registry.Africa.com, I can register a domain name directly on your website. So, I am wondering. Do you get more of your registrations through your website as compared to the 1500+ resellers you have? How does that shake out? Ope: Actually we are getting more from our resellers than we are getting through our own website. Michael: Is it like 55-45 or is it a majority, like 80%, of the sales from resellers? Ope: Right now it is about 70% coming from our reseller registrars. Michael: Great. And in addition to selling domain names, what other products and services are you selling through Africa.com? Ope: So, when you come to our registry .Africa.com website, you can buy a domain name. You can also buy a site builder too, which allows you to quickly build a website of your choice. And this is one of the attractions with the African market. A lot of people are getting on the web for the first time and they want to build their own web store. And providing them with tools, and we continue to work with (Unclear 23:51.5) provider to improve this, but providing them with tools really that they can quickly use to build their own website with very little technical skills, I think, is an appeal to most people. Michael: Yeah, definitely. So, you’re using CentralNic as the backend registration system. Are you using another platform for allowing customers to build websites on top of those domain names that they register? Ope: Yeah, currently, right now, we are offering the website building tool from BaseKit, but we are also talking to two other companies that are providing website building tools, and we are very close to signing a deal with at least two of them. Michael: Great. And will that provide additional functionality, or is it just better integrated into your offerings? Ope: I think it is going to do both. It is going to give us better functionality for some of them. Some of them actually have third party applications that can run through their own website building tool. And also, the image. You want to put images from Africa, included in that offering so that it can be specific. So, you can have more Afro-centric and Africa-centric tools that you could use. Michael: Right. Great. And so, I am not sure if you can answer this, Ope, but I know a lot of people that are watching this video might be thinking: “I own a great premium, generic, single-word that I could easily sell to tens or hundreds of thousands of companies out there that might want to buy third-level domains and get a website up and running.” Can you talk about what the costs of running a registry are? For example, is there a base cost per year that always runs five figures and then you pay a per-domain name register back to CentralNic, who runs your registry? Ope: I am not sure I understand. Can you repeat that? Sorry. Michael: You bet. No problem. It was not that clear of a question. Let me try and rephrase it. Can you talk about the expenses associated with using CentralNic as your registry? Is there are one-time fee per year, like a flat fee, or is the fee based on how many domain names are registered and administered by CentralNic per year? Ope: Right now we have a sharing formula up to a certain number. And then, when we surpass that number, then we change the ratio. Right now it is a sharing formula that we are using. Michael: Got it. And does that sharing formula allow you to be profitable from day one, or is there an upfront cost that you needed to pay CentralNic in order to set up the system that you need to recoup over time? Ope: For our own specific need, there was no upfront cost. It was more based on volume and based on the sharing formula, so we did not have to pay anything upfront. Michael: Great. And since you are in charge of the domain name business at Africa.com, do you find that it is difficult to have your technologists integrate CentralNic’s system with Africa.com’s content management system, and then your website development system to bring it all together, or is it pretty straightforward the way that the technologies allow you to interact? Ope: It was actually very straightforward. It was pretty easy. I mean these guys are very professional, and they’ve done a lot of two-level, third-level domain names. I mean they are the pioneer when it comes to this area, so they have done a very wonderful job. It is was very straightforward. Michael: Excellent. So, if you had to guess how many domain names you need to be able to sell to hit your goal, Ope, what is your goal? If you ever move on from this position and you say: “I hit my goal; here is what it is,” what would that number be? Ope: For me, I am looking at 100 thousand domain names in the next 18 months to two years. That would be a good goal, but it is not an easy goal to meet, because people have got a lot of other choices coming up. I have got more TLDs, more choices. So, I could have a very high goal, but then the market also has other extensions. So, it is always difficult when you have more choices, but it is good for the consumers. Michael: Definitely. Well, I want to ask you about those more choices, but first I want to ask you, if I am physically located in Nigeria, let’s say, and I go on my smartphone and I type in Google, it is likely going to redirect me to Google.ng – a Nigerian-focused search engine for Google. And let’s say I want to search for flights, or a plumber, or an electrician. Do you think Google is more likely to return results in .NG or .COM domain names? Ope: Well, if you do it right now, you are likely to get a .NG if you are within Nigeria. But again, it depends on the search word that you use. So, if you were going to use Safari, for instance, within Africa it could give you names like Safari. It could be South Africa. It could be Africa. So, it all depends on the keyword that you are using, but yeah, you are absolutely correct. If you are within Nigeria and you type in Google, it redirects you to Google.com.ng. And if you are in Kenya, the same thing – Google.com.ke. Michael: Ope, Human IPO reported this month on the .ZA Central Registry – the registry operator for the .CO.ZA Internet domain name space. They plan to kick off its sunrise and landrush stages for the acquisition of domain names by March 2014, and they have applied for and passed ICANN initial evaluation for the following geographic top-level domains: .AFRICA, .Joburg, .CapeTown, and .Durbon. How will these top-level domains impact the sale of .Africa.com third-level domains? Ope: Right now, you mentioned the same how it impact. We have got the personal advantage. We have got names already and we also have a registrar function. We are perfectly happy and willing and able to sell .AFRICA’s names when they do come online. In terms of impact, there will be some impact. There is no doubt, but we have names that we really convert to .AFRICA as well. So, we are going to be a reseller of .AFRICA.com and the reseller of .AFRICA names as well as offering .AFRICA.com names to our clients. So, we are in a unique position because we are both a registry and we can also be a registrar. So, it is a very unique opportunity that we have. Michael: Definitely. And there has been a lot of discussion around confusingly similar top-level domains coming out and confusion among people. I would think that you are already offering Something.Africa.com is going to be confusing with .AFRICA. I am not sure how people use the domain names in Africa, but are they more likely, when .AFRICA is available, for example, to type Starbucks.africa and just append the .COM automatically to it, or is that not going to be confusing because Africans are starting off on the mobile web and probably understand domain names better than US people, for example? Ope: It is actually hard to tell right now. I can tell you that, in Nigeria, people type .COM.NG without any problems. And they do type .NG as well, but sometimes people forget to the put .NG. They just type .COM and they forget to put the .NG. So, it really depends on the level of the user and it is hard to predict how users are going to use this. But you are right to say that, in Africa, mobile is very important, so really, if you have a website that is to be more mobile friendly, it is more likely that you might not even (Unclear 33:17.0) who types the two dots. .AFRICA might be at an advantage there, but if they are using Africa.com names in their advertisements, obviously people are going to remember to put the .COM in there. Michael: Yeah. So, how is Internet connectivity in developing nations, in Africa, different than in developed nations, like the United States? Does everybody have Internet connectivity on their mobile phones, or is there still vast areas that have no Internet connectivity? Ope: Well, in the biggest part of Nigeria and some other parts of Africa, mobile devices are the key tool that people use. So, when I say mobile devices, I am not talking about mobile phones alone. I am talking about tablet PC and smaller, generic pieces. Tablet PCs are everywhere in Africa. Maybe not Samsung, but they have got brand names like Techno and Vantium, and all those generic names, but they have mobile devices. So, most people are going to be using mobile devices to access the Internet. Now, on the mobile devices, the challenge that people have is that the screen might be small. That has not stopped BlackBerry. In Nigeria, most people use BlackBerry because of that cheap data bandwidth that they are able to get, because really, the Intel coast, in Nigeria, are the ones that are keeping BlackBerry alive, because they give you this bandwidth that you cannot get on Samsung or anything like that. Apple devices, but on BlackBerry you could have unlimited data for one month for a fixed price. Michael: Jeez, I did not realize that. So, I need to really go look at a browser on a BlackBerry to see how DomainSherpa.com looks, because all your friends in Nigeria are going to be looking at it and, for all I know, my website may not even work on a browser on a BlackBerry. Ope: Well, if you are using the standard tools, I think they will see, because they are used to seeing small screen. So, just optimize your website for smaller screens. That is the advantage. Michael: All right, good point. So, here is the final question for you, Ope. In the pre-interview call, you mentioned that people in Africa are okay with typing long domain names, even on their mobile devices, tables and phones. But if most people are getting online via tablet and phones, isn’t a shorter domain name more advantageous to prevent typographical errors, make it easier to remember, and things like that? Ope: Yeah. Again, it all depends on the user. Yes, I mean it is obvious that the less you have to type, the better, but then the users also specifically know to bookmark the names that they type. If they like a particular website, they go there and they only have to type it once. They can bookmark it. So, it really depends on the (Unclear 36:17.2) of the user. Michael: All right, makes sense. If any of the viewers have additional questions for Ope, please post them in the comments below and we will ask him to come back and answer them. Ope Odusan, Managing Director of Africa.com Domain names. Thank you for coming on the show today, sharing your knowledge of the domain name industry, and thanks for being a Domain Sherpa. Ope: Thank you very much for having me. It was a pleasure to be here. The world has moved and we are expected to find the right domain zone for our business. We shouldnt be paying extra for a particular domain when another will do the same job and effectively too. @Michael, Quick question, a little off topic, but what program do you use for the transcriptions? I use a fantastic transcriber named Michelle. She’s available for work at effectiveexecutive aol .dot. com. I highly recommend her. Thanks again for everything. I really appreciate and value what you bring to the industry! Welcome OpeOluwa Odusan, well .Africa.com is good but .Africa is better. You know quite well that evrybody loves short domains including short extensions, even Africans; you can as well compare my aguementation from your names Ope, is in a short form and that is why those long long extensions will surely not well embraced as expected. Long extension can not have any strong affection by internet users, and it will be lossing traffics to short extensions, especially .com. The .Africa.com .safari and .Africa are too long, they can only be embrace by those who only want their presence to be felt in Africa and most of them will likely redirect to their main sites in order to maximize their traffics. However, it is a good thing to have something africa. Congrats for having .africa etc. Thanks. It’s just amazing how much you can learn, for free, from excellent sources like this interview. So the main takeaway from this interview is that a good name gives you lots of opportunities to monetize. Thanks, Kassey. Much appreciated. And I think your conclusion is a good one. Thanks, Iglow. I appreciate you watching and commenting. Thanks for asking the clarifying question, Dave. Thanks for clarifying some facts Mr Ope. About the .NG domains, would you reduce the price later or would it remain at $94 per domain. Besides, if well developed countries like usa can get a .us domain for almost free (via coupon) or $10 regular, i don’t see any reason to fix such a price for a developing country like Nigeria. I thought so too. Ope gave his reason why he thought it works during the interview.